What happens when teens throw a party in a contemporary art museum? Come find out! Teens take over the museum to host a variety of events all year long. Join us on the dance floor at a teen night, discuss art in the galleries at The Current or learn self-care practices (and get your nails painted) at a pop up event! Celebrate the ICA's 75th Anniversary with a bang at Teen Night, one of our legendary, teen-produced, art happenings! Come see the latest films created by the teens in the ICA Teen New Media Program! Through video and 5.1 Surround Sound, students in the Fast Forward program explore the themes of human relationships and personal connections. Presented by the Teen Arts Council. 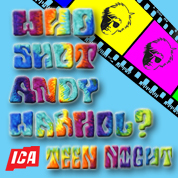 Teen Night: Who Shot Andy Warhol?